With the uptick in SpaceX launches, the U.S. achieved something it hasn’t been able to since 2003—be the world’s leader in launches. Last year, the U.S. logged 29 successful flights (18 of them from SpaceX alone). This year, the company plans to launch 26 times, including its commercial crew endeavors. In August of this year, SpaceX plans to demo its new Crew Dragon, the ship that will soon ferry astronauts to and from the International Space Station. During the mission, dubbed Demo-1, the unoccupied Dragon will launch from Florida to the ISS, where it will dock with the station and remain on orbit for a few weeks to test how it performs before a second launch—this time with people on board—in December. Thanks to Musk’s prowess, rocket companies across the globe have had to up their game. Newcomer Blue Origin boasts that its rocket (currently in development) will be capable of flying 25 times before refurbishments are needed. China has even taken some notes from Musk’s playbook and is working on developing reusable rockets that will one day be able to compete with SpaceX’s. “Any permanent human presence on the lunar surface will require such a capability,” he said. Charania said “we’re actively working on the descent stage for Blue Moon, the capabilities, the partnerships that are required to enable that service … to start going back to the moon with larger and larger payloads.” Blue Moon could help answer longstanding scientific questions about the moon’s origin and evolution, delve into lunar resource identification and extraction, and “enable human lunar return,” Charania said. When Elon Musk’s SpaceX first launched its Falcon 9 rocket back in 2010 it was thought of as a novelty venture by a tech entrepreneur that would be little more than a tech demonstration. No one thought it would become the de facto rocket for getting satellites, and even people, into orbit. Exactly 54 launches later, SpaceX has become famous the world over for its reusable rockets, with their discarded boosters landing dramatically back on their launch pad, or on drone-ships offshore. So far about 20 first-stage boosters, complete with engines and fuel tanks, have been recovered. Falcon Heavy is about to take off in a big way. Just a few months after its thrilling debut, SpaceX’s heavy-lift rocket is back in the headlines. Not for sending another cherry-red Tesla into space, but for gaining some major accolades from the Air Force. In a surprising move, and after just one flight, the Air Force announced it has certified Falcon Heavy for military launches and awarded the vehicle its first highly coveted launch contract: the AFSPC-52 mission. The contract is valued at $130 million—that’s the price of ferrying the Air Force Space Command-52 satellite to its intended orbit sometime in 2020. A diverse range of scientists, engineers and mining technologists have begun blueprinting what hardware and missions are required to explore and establish a prospecting campaign for water ice at the poles of Earth’s moon. 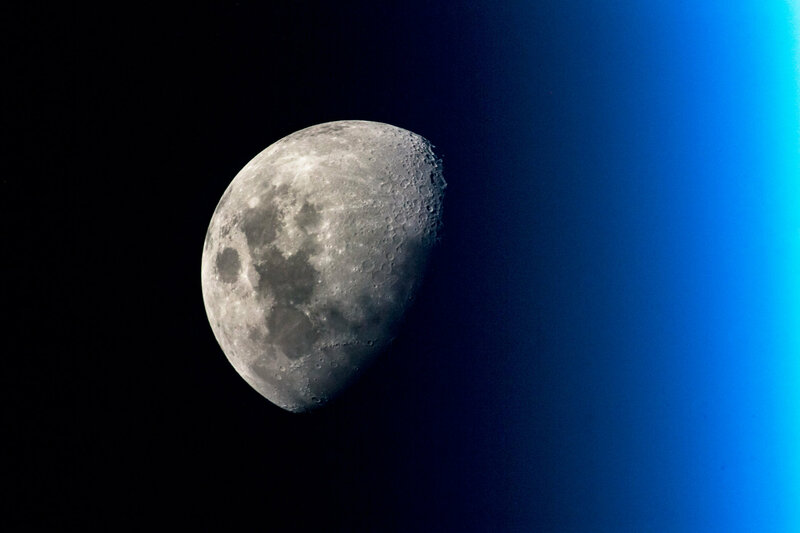 Why have they warmed up to ultra-cold lunar ice? Water ice can be converted to oxygen, liquid water and rocket fuel. Exploiting the stores of this resource — which is thought to be abundant within permanently shadowed polar craters on the moon — could help pioneers survive and thrive on the moon, and help entrepreneurs turn a profit. Earth’s moon is rich in valuable resources that could help pioneers survive and thrive on the moon — and help entrepreneurs turn a profit. NASA’s new boss wanted a deputy with technical chops. Trump is sending him a Senate staffer instead. WASHINGTON — The White House nominated a veteran Senate aide with little space experience to be NASA’s deputy administrator July 12, a month after the agency’s administrator said he wanted someone with technical expertise for the job. In a statement, the White House announced its intent to nominate James Morhard to be deputy administrator. The position, like that of administrator, requires confirmation by the Senate. Michael Hayduk, chief of the computing and communications division at the Air Force Research Laboratory says quantum technology will be “disruptive” in areas like data security and GPS-denied navigation. WASHINGTON — Top Pentagon official Michael Griffin sat down a few weeks ago with Air Force scientists at Wright Patterson Air Force Base in Ohio to discuss the future of quantum computing in the U.S. military. Griffin, the undersecretary of defense for research and engineering, has listed quantum computers and related applications among the Pentagon’s must-do R&D investments. Quantum computing is one area where the Pentagon worries that it is playing catchup while China continues to leap ahead. The technology is being developed for many civilian applications and the military sees it as potentially game-changing for information and space warfare. Mr. Steven now has some more margin for error. SpaceX has outfitted the speedy boat with a much larger net, to give it a better chance of plucking payload fairings — the nose cones that protect spacecraft during launch — out of the sky. “Mr. Steven — now with more net. SpaceX’s fairing recovery vessel has been fitted with a 4x larger net ahead of its next recovery attempt targeted for later this month,” SpaceX representatives wrote via Instagram Friday (July 13), along with before-and-after photos of the 205-foot-long (62 meters) boat. Mr. Steven is part of SpaceX’s push to develop fully and rapidly reusable rockets and spacecraft. Such technology could slash the cost of spaceflight enough to make bold projects like Mars colonization economically feasible, SpaceX founder and CEO Elon Musk has said. SpaceX already routinely lands and relaunches first stages of its workhorse, two-stage Falcon 9 rocket. Snagging Falcon 9 fairings makes a lot of economic sense as well; they cost about $6 million apiece, Musk has said. And plucking them out of the air, before they hit the highly corrosive seawater, is key. Each Falcon 9 fairing consists of two pieces, both of which come back to Earth under parachute (actually, parafoil) shortly after liftoff. The fairing halves are also equipped with small thrusters and can therefore steer themselves toward desired splashdown points. SpaceX has given its rocket-nose-cone-catching boat, Mr. Steven, a much bigger net. A space shuttle-era main engine is undergoing a series of daily test firings to demonstrate its suitability for use on a reusable spaceplane under development. The Aerojet Rocketdyne AR-22 engine is in the midst of a series of 10 100-second engine firings over the course of 10 days at NASA’s Stennis Space Center in Mississippi. As of July 2 the company has completed six such tests and was on track to complete the rest on schedule. The engine is a version of the Space Shuttle Main Engine with only minor modifications, said Jeff Haynes, AR-22 program manager at Aerojet, in a July 2 interview. “We’re not designing or building any new hardware for this engine,” he said. “We’re taking and making use of existing hardware, most of it being flight proven.” One minor difference in the engine, he said, is using a new flight controller, or computer system, from the updated version of the RS-25 engine intended for use on NASA’s Space Launch System. Elon Musk sent engineers from his SpaceX and The Boring Co. companies to aid in the rescue of a youth soccer team in Thailand that’s trapped in a cave and running out of time. Orbital Assembly and the Gateway Foundation are working on a reasonable set of plans and steps to build a space station that is 488 meters in diameter. They would start with a hub that is 78 meters wide. The National Space Society has the goal of 100-meter wide space station that weighs 8500 tons. It could house 500 people.